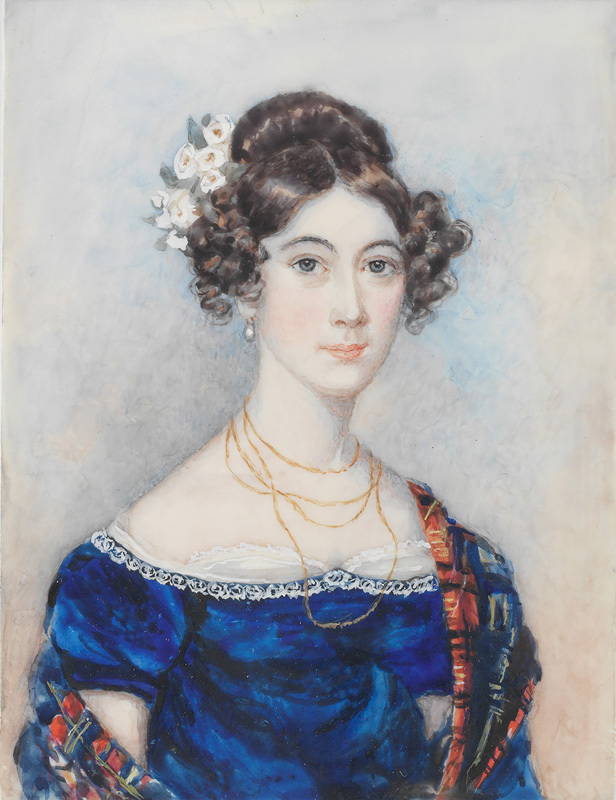 This right facing ½ length miniature portrait shows Celia Reibey (1803 – 1823) at about 18 years of age. It is likely to have been painted in Britain during her visit there in 1820-1. Celia is portrayed in evening dress and wears a very high-waisted, royal-blue gown [possibly of silk velvet] with short, puffed sleeves and a wide, low neckline with fine white lace edging, revealing a sheer white muslin ‘tucker’ which has been carefully arranged in scalloped folds to show off her youthful décolletage. Her light brown hair is centre parted and brought up into a high roll at the back, with a corsage of roses on the right, and bunches of ringlets arranged over each ear. She wears pendant pearl earrings, a long fine gold chain looped loosely several times around her neck, and carries a brightly-coloured tartan stole, possibly also of silk velvet. Celia Wills, nee Reibey (1803 – 1823), was the eldest daughter of Thomas Reibey (1755 – 1811) and prominent female emancipist and colonial business woman Mary Reibey, nee Haydock, (1777-1855). In March 1820, Celia Reibey, and her younger sisters (Eliza and Jane) travelled to England and Scotland with their mother, returning to Sydney the following year. On 12 June 1822, Celia married Thomas Wills (1800-1872), son of her father’s business partner Edward Spencer Wills (1778-1811) but she died 15 months later, in October 1823, having given birth to a daughter in March of that year, who died as an infant (aged 11 months and 5 days) on 11 April 1824.